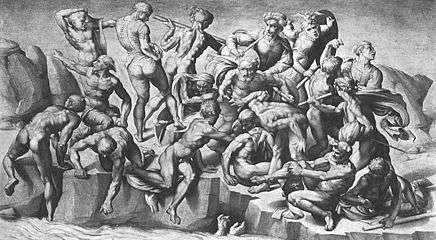 The Battle of Cascina is an influential lost artwork by Michelangelo. The painting was commissioned from Michelangelo by Piero Soderini, statesman of the Republic of Florence. It was intended to be a fresco painted on a wall of the Salone dei Cinquecento in Palazzo Vecchio. The opposite wall was to be decorated by Leonardo da Vinci, who was commissioned to depict the Battle of Anghiari. The two battles were notable medieval Florentine victories. The Battle of Cascina was fought on 28 July 1364 between the troops of Florence and Pisa, resulting in victory of the former. A thousand Pisans were killed and two thousand more were captured. Michelangelo never completed the painting, but did produce a complete cartoon of the composition. The cartoon was copied by several artists, the most notable extant copy being by Michelangelo's pupil Sangallo. Some of Michelangelo's preparatory drawings also survive, along with prints of part of the scene by Marcantonio Raimondi. According to Michelangelo's biographer Giorgio Vasari the original cartoon was deliberately destroyed by Michelangelo's rival Bartolommeo Bandinelli because of his jealousy of its fame. Michelangelo depicted a scene at the beginning of the battle when the Florentine army was initially taken by surprise when the Pisans attacked. He depicts Florentine soldiers bathing naked in the river Arno responding to a trumpet which warns them of the sudden Pisan attack. As the soldiers emerge from the river and buckle on their armour, they are threatened by shots from the Pisans. Several soldiers look or point towards the Pisan position to the left. One soldier has apparently been hit and fallen back into the river, while others leap energetically into action. 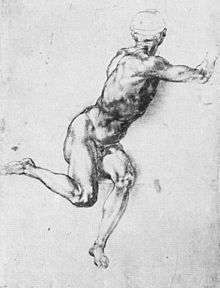 The chosen episode allowed Michelangelo to depict his favoured topic: the naked male figure in varieties of contrapposto. Wikimedia Commons has media related to Battle of Cascina.